If you’re a hiking enthusiast, Helen, Georgia will never disappoint. A mecca for nature lovers, Helen is a very different kind of Southern town. 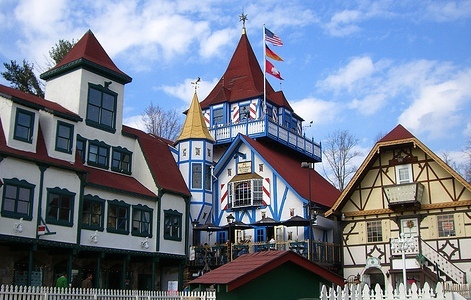 Nestled in the Blue Ridge mountains, this Bavarian village is straight out of a German storybook. Walking on cobblestone streets lined with Alpine restaurants, charming shops, and colorful buildings, you can almost forget where you are. One of my favorite memories of Helen is tubing down the Chattahoochee River with my husband, after a day of exploring the village. The normally smooth and relaxing tubing trip down the river was an especially hilarious one for us. We didn’t account for the low water level, and instead of enjoying a two-hour trip, it took close to four hours of laughing at each other while getting stuck on the rocks, then flipping over as we lost our balance prying ourselves out! A push stick and water shoes are a must have on this river adventure. Check out Cool River Tubing if you’re ever passing through Helen. And now to the hiking trails! From the touristy and challenging steep climb to Anna Ruby Falls, to a lesser known wildlife trail we came across while exploring the countryside, we had our pick of dozens of picturesque trails. While on a hike on one not so primitive trail, lined with plaquards depicting the various wildlife of the region, we spotted a sign on the BLACK BEAR. I have to admit that we were just a bit intimidated, okay more like terrified, after seeing that bear sign. We quickly brushed off the fear and pushed on, that is until we came across a plaster cast of a bear paw in the middle of our trail. Needless to say, we finished that trail in record speed! Here are some more pics from that hike. After a long day of exploring the village of Alpine Helen, and walking the surrounding trails, we were grateful and happy to wind down for the evening at our charming B&B. The Nacoochee Valley Guest House is just a few miles outside of the heart of Helen. It is the perfect restful getaway, owned and operated by a mother/daughter team. These charming ladies also run the gourmet restaurant located at the inn. Every meal at Bernie’s Restaurant is more delicious than the next. It’s a good thing our daily hikes balanced out the amount of food we devoured at Bernie’s! Our final adventure on this trip was our very first zipline tour. Ziplining with Nacoochee Adventures was exhilarating, and a bit frightening. In the end, we were ready to do it again, and again. Whether you visit Helen for the trails, the adventures, or the charm of its unique village, this is a place you will never forget; a gem in the beautiful mountains of northeast Georgia.